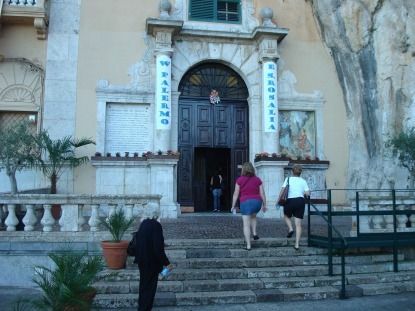 The shrine of Santa Rosalia is a sanctuary on Monte Pellegrino, built around the XVII century on the basis of previous religious buildings in honor of the new patron saint of the city.The sanctuary is located inside a cave where there is a large amount of water which is channeled towards the outside. The sanctuary contains the bones of Santa Rosalia and many votive offerings of the faithful devotees of the saint, whose bones, according to tradition, had been found on the mountain by a hunter in 1624 while the plague scourged the city. 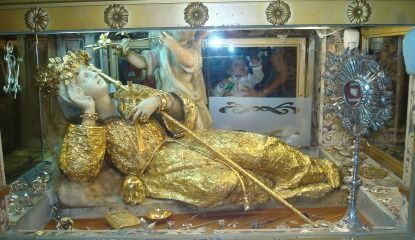 According to tradition, thanks to the discovery, the plague was defeated and the Senate of Palermo he dedicated the shrine. Giuliana Nocera coocking class, click here!